Parish churches in Shoreham are staging a new free exhibition to commemorate the centenary of the First World War. The exhibition offers a unique insight into wartime life through words and photos, showcasing the wartime contribution made by the parish communities of St Mary de Haura, St Nicolas and the then newly-built Church of the Good Shepherd on Shoreham Beach. Similar work was carried out by other denominations in the town and their parishioners. The exhibition text has been researched by Jenny Towler, vice chairman of the Shoreham Society. She said: “It’s been a real labour of love researching the stories of the role of the parish churches in supporting those who kept the home fires burning and the effect on the town of the men who went off to the Western Front from Shoreham Camp. The Rev Ann Waizeneker and St Mary de Haura Church Warden, Ian Tompkin, have also supported the exhibition while Shoreham Beach councillor, Joss Loader, has provided support with editing and publicity. The Revd Ann said: “The Shoreham churches played an important part in supporting the community in wartime and ministering to those who suffered in so many ways. The exhibition – When the Guns Fell Silent – runs at St Mary de Haura in Shoreham town centre from Saturday to Sunday, November 4. It will then move to St Nicolas Church in St Nicolas Lane, from Monday, November 5, to Thursday, November 15. 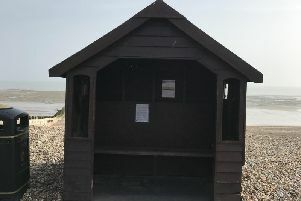 It will end at the Church of the Good Shepherd in King’s Walk, Shoreham Beach, from Saturday, November 17, to Friday, November 30. The exhibition will be launched at a Shoreham Wordfest event combining words and music, titled A Great Calm, which takes at St Mary de Haura on Saturday, October 20, at 7.30pm – find out more here. Shoreham residents will also post silhouettes in their windows to remember the town’s war dead. Every householder known to live in a town centre property once occupied by a soldier who went off to war is being offered a window sticker, bearing the image of a soldier’s silhouette, to remember those who made the ultimate sacrifice. This ties in with the national commemoration of There but not there. The churches are also grateful to the Armed Forces Covenant Fund Trust for funding six perspex silhouettes to commemorate The Fallen.